SO. I obviously needed to get an Alberta driver’s license..especially since I have lived here over a year. Well, I couldn’t get one until I obtained my permanent residency (in February). I walked into the Registry- which in Canada is like the DMV/RMV/passport place/health care card place/place for lots of stuff. I have usually been going to the location closest to my house. Last month, I went in with my PR card, MA license, MA driving record and money. The girl friggin tells me I need proof of residency. Um yeah, hi, that would be my PR card ya dummy. But no, not acceptable she says. I needed either a utility bill or bank account statement. OK. So then I went over to the Bank and opened an account. I had the clerk stamp and sign a paper showing my existing account. Go back to the Registry and they say NO it has to be a statement that has been mailed to my address. Tyler called our utility company and added me, but we wouldn’t get a statement for another month. My attempt to get a license was over for that day. I go back yesterday with BOTH a mailed statement from my bank and utility company. The girl at the Registry denies me AGAIN because my driving record from MA (that I paid $6 to get) did not say the state of Massachusetts on it. Without that ‘proper’ information, I could only get a GDL license (basically a stupid provisional license in which I would have to take a driving test) HELLS NO YOU GUYS. I have been driving for 11 years. I am NOT taking a driving test. I then resort to looking into getting my driving record from the state of NY. But I found that if your license has been expired for five years or more, they no longer keep your records on file. Another dead end. And the MA website only allow me to obtain a $6 unattested record or a $20 record which would ONLY be mailed to the address listed on my license. Dead end again. I took a screen shot of all that information, along with my OLD MA license (which does not show an ‘issued’ date), my existing license, and all the other correct proof I had to a different Registry office, and the clerk there was SUPER friendly and accommodating. Long story short, I finally got my license (although it still has potential to be reviewed for the GDL class). There were several trips, lots of time, and COUNTLESS tears shed in the process. So frustrating! It’s not like I’m trying to cheat the system or anything,..just nothing wants to come easy for me. That was a longer than intended rant. But that’s that. 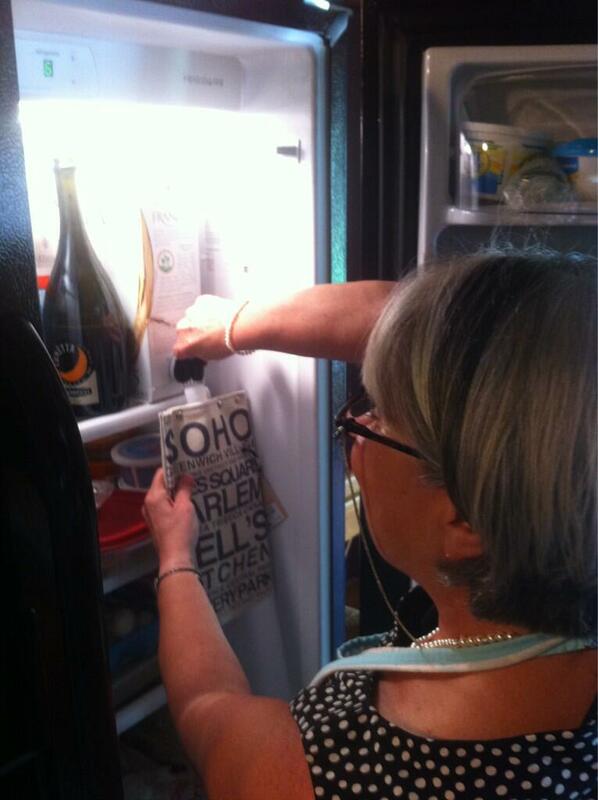 Onto the booze! Monique (http://burpeestobubbly.com/) sent a couple of pics! 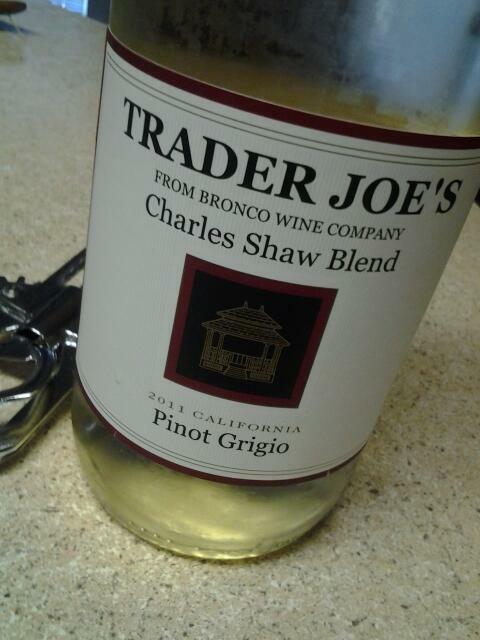 Chelsea (http://thedancingrunner.wordpress.com/) had some TJ’s Charles Shaw (TWO BUCK CHUCK!) Dang I miss Trader Joe’s. She tweeted me the pic saying it went great with buffalo chicken lettuce wraps. Might have to put those on the dinner menu soon! Check out what my mama sent me! 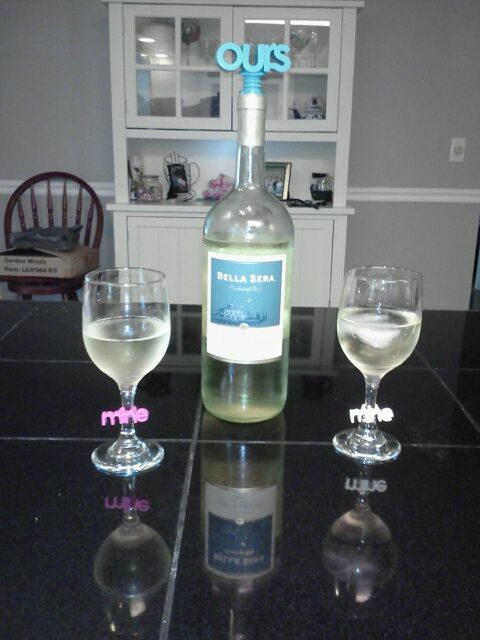 White wine, ya whatever, but the little tags and the bottle topper are the best! Know why? Because I sent them to her for Mother’s Day. I know what that lady needs and what she’ll get the most used out of. It was a four course meal, with a pint of the Rosmarinus for cocktail hour, a sample size of the beers paired with the shellfish, pork and dessert course, and another full pint with the main course (lamb). Being incredibly punctual, we were the first people to arrive, and were greeted with a cold pint. And it didn’t disappoint. It has a lovely amount of Rosemary flavor that would be perfectly matched with summer grilled meals- in my opinion. As we sat for dinner, we listened to the introduction by the Brewmaster himself. During that time and in between each course, he gave us info on the premise for this ale, the history of ales, why each course was paired with each beverage, what Big Rock had in store for the future, and plenty of other interesting things! 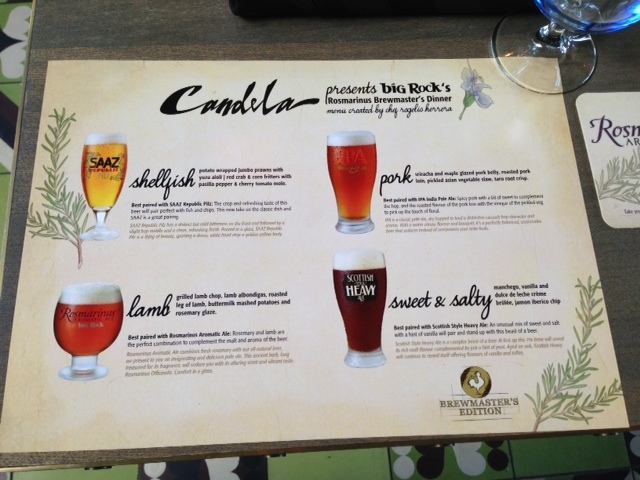 I was getting really excited for each course and am now very intrigued for what the brewery has yet to come. Tyler and I are big fans of the Brewery, and we often purchase their seasonal beers and have yet to be disappointed. The first course was shellfish. 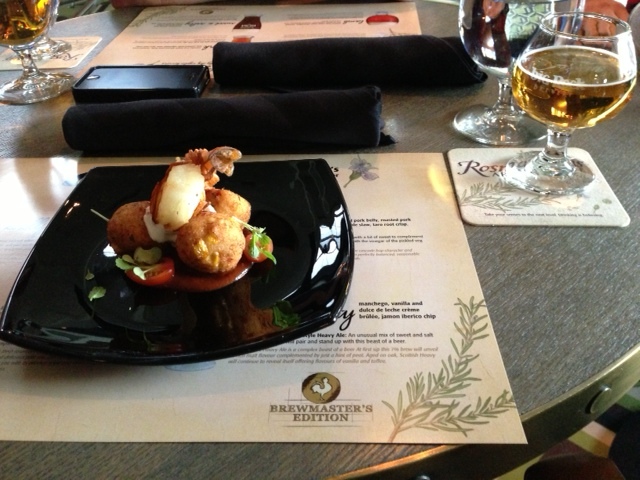 “Potato wrapped jumbo prawns with yuzu aioli, red crab & corn fritters with pasilla pepper and cherry tomato mole” This was paired with Big Rock’s Saaz Republic Pilz. I was hesitant for this course because I absolutely DESPISE shrimp, but I felt obligated to try. I managed to hide my grossed-out face, and continued on to the crab & corn fritters which were delicious with the mole. And of course I loved the Saaz. Second course was Pork..my favorite. 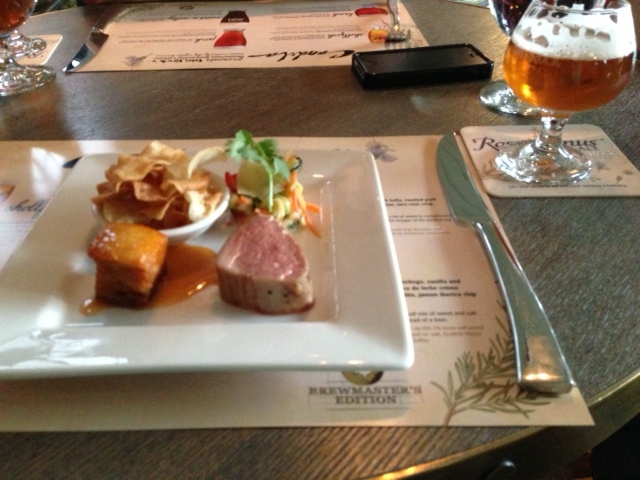 It consisted of “Sriracha and maple glazed pork belly, roasted pork loin, pickled asian vegetable slaw, and taro root crisp.” This was paired with their IPA. I have to say, this plate could have been multiplied by 100 and I would have eaten it all. If you’ve never had pork belly- go try it. It is SO delicious. I had to refrain from moaning with each bite- especially since we were sitting among strangers! And the taro root crisps were like angelic potato chips that I needed more of! 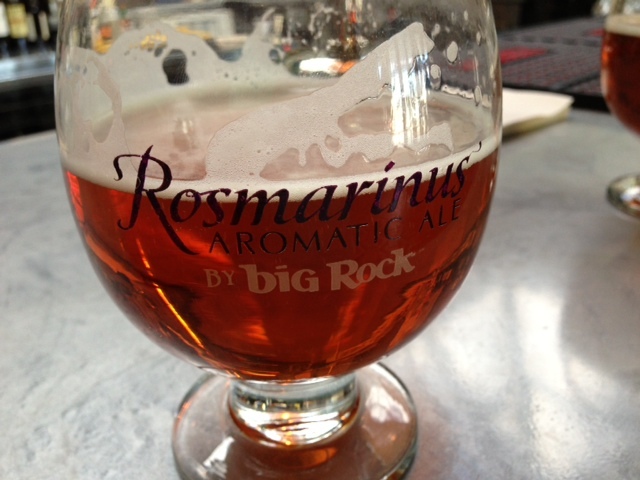 With the main course, we had another pint of the Rosmarinus. The meal consisted of “Grilled lamb chop, lamb albondigas (meatballs), roasted leg of lamb, buttermilk mashed potatoes and rosemary glaze. 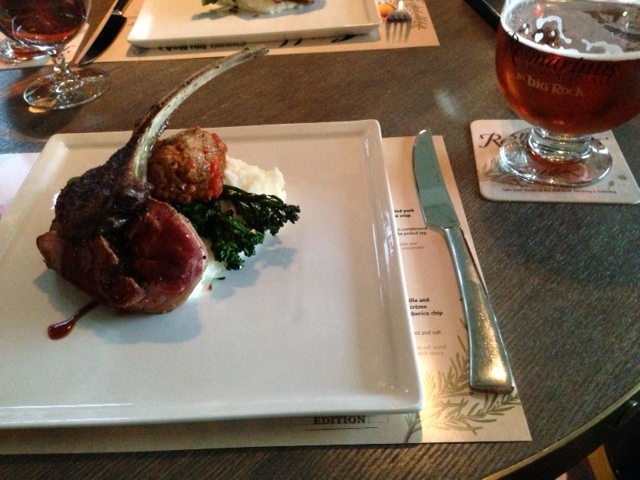 I didn’t care much for the meatball, but the grilled lamb tasted immaculately perfect with the ale. Mmm Mmm. Last course- dessert. Even though I was already STUFFED, I am not one to pass up the sweet stuff. 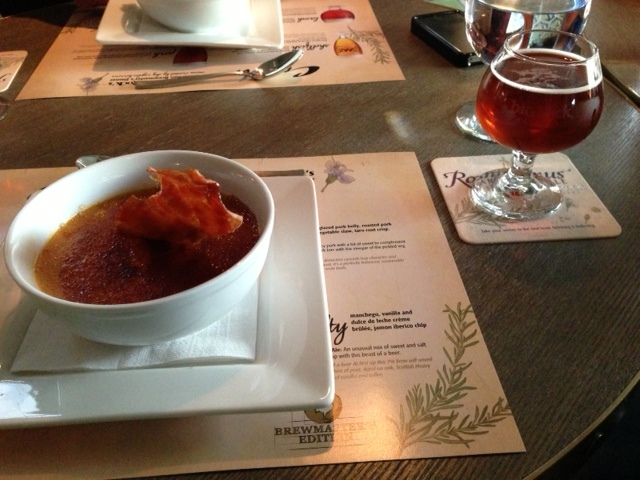 Our dessert was “manchego, vanilla and dulce de leche creme brulee , jamon iberico chip.” It was paired with the Scottish Style Heavy Ale with is absolutely wonderful. I mean, that ale alone could’ve been dessert, but the creme brulee with basically a huge piece of glazed ham sticking out of it was just over the top. I really REALLY wanted to eat the whole thing, but my stomach wouldn’t let me! It was a really wonderful event and I can’t express my gratitude enough for being invited to participate. 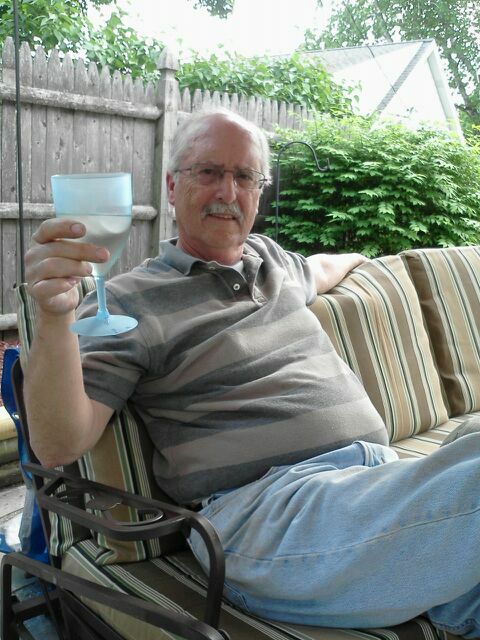 Ok, now with all this beer and wine talk, I’m craving a glass. Since my migraine has downgraded to a headache, I think I shall indulge. Have a good night! I probably shouldn’t tell you that my favourite thing in the whole world to BBQ is rack of lamb. Usually our Registry offices are very helpful. That first one you went to probably has a hate on for Americans. They system now is way better than it used to be. Glad your headache is gone. So frustrating that you had To deal with that registry nonsense. What a biotch! So glad you got it all resolved and finally have an AB license. The brewmasters dinner sounded and looked amazing! My mouth was watering at every picture. I’m not big on beer but that would have been a fun event. 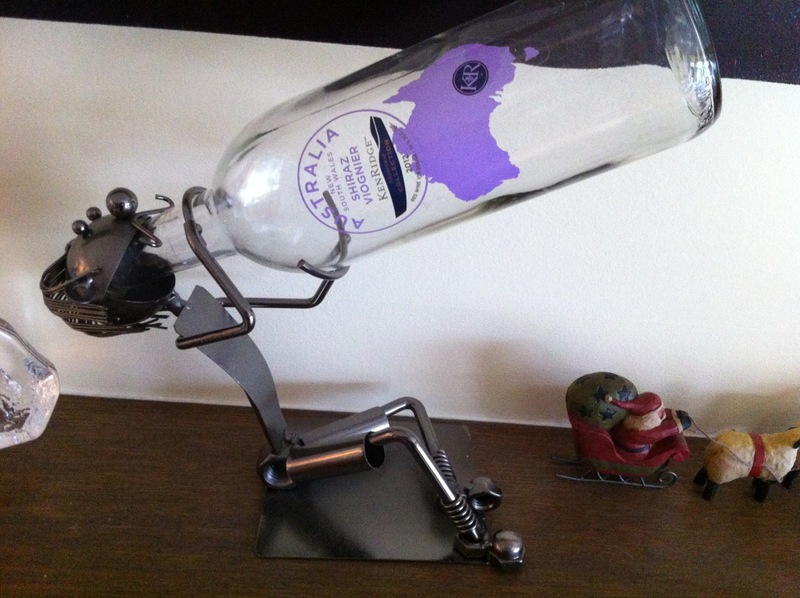 I love Keith’s wine bottle holder and super cute wine charms and bottle stopper that you got your mom. 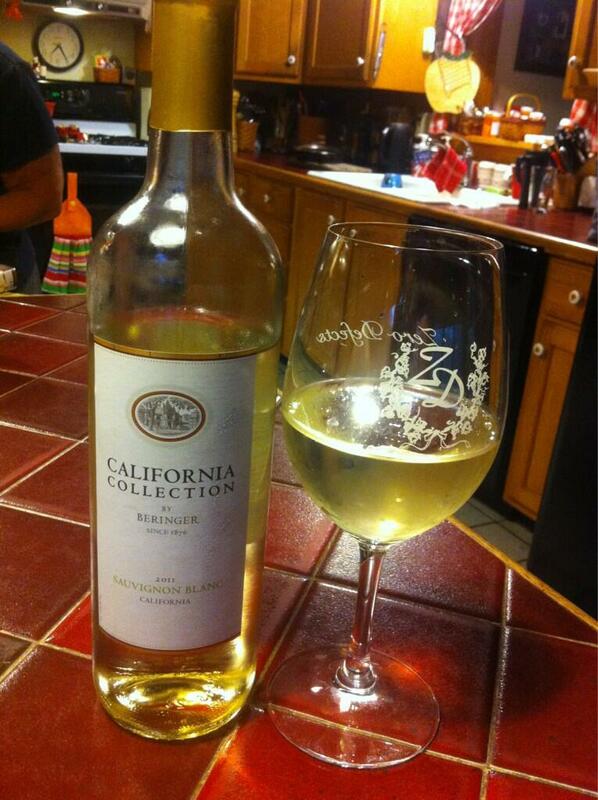 I love those cute little wine things you got your mom!! Yikes, that’s a long process just to get Driver’s License. No wonder you had migraine. Canadians are so strict!